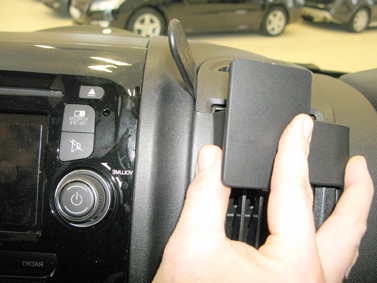 The ProClip is a mounting bracket that you attach onto the vehicle’s dashboard. It provides a mounting platform for mobile phones and other devices that you want to have within easy sight and reach in the car. Safe, neat and convenient! 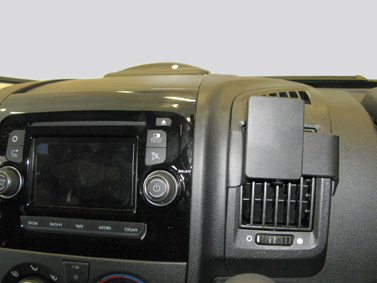 The ProClip has a perfect fit, it is custom made for each vehicle to ensure a secure base for installations. The ProClip is easy to install. The bracket simply snaps into place in gaps in the dashboard, you do not need to drill holes, not use special tools or not dismantle the dashboard. Made in black ABS plastic. Comes with detailed installation instructions. The mounting plate is equipped with predrilled holes which make the installation of equipment on the ProClip easier. The holes suit all Brodit holders and other products with standard holes, the hole pattern constists of one set of AMPS-holes as well as two sets of double-holes placed in different height. 1. Use the enclosed alcohol pad to clean the area where the ProClip is to be installed. 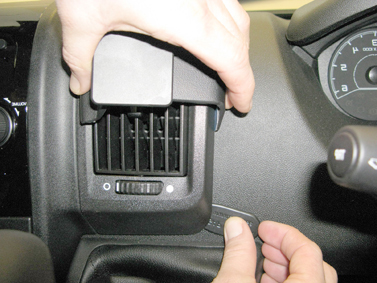 Press the thin end of the enclosed gap opener into the lower part of the gap between the frame surrounding the air vent and the dashboard, to widen the gap. Peel off the adhesive tape covers on the ProClip. 2. Press the gap opener further into the gap and carefully prize the gap wider. In the same time: Press the angled edge on the right part of the ProClip into the gap above the gap opener. Pull out the gap opener. 3. 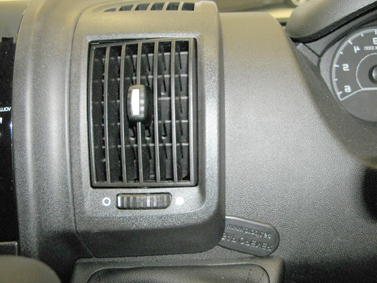 Press the gap opener into the upper part of the gap between the frame surrounding the air vent and the dashboard. Press forward on the ProClip so the angled edge on the left part hooks into the gap below the gap opener. Pull out the gap opener.